The aeolian harp (also æolian harp or wind harp) is a musical instrument that is "played" by the wind, which initiates harmonic resonances to create the harp's often eerie sound. Also known as the harmonic harp and spirit harp, the aeolian harp originated in ancient Greece. The instrument was also found in the cultures of India and China. 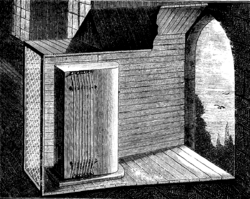 German Jesuit scholar and renowned Egyptologist Athanasius Kircher (1601–1680) is credited with having constructed the first modern aeolian harp in 1650. 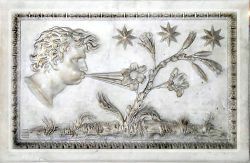 The aeolian harp takes its name from the Greek god of the wind, Aeolus, since its other-worldly sounds are initiated by the movement of the wind over its strings. The instruments became very popular as household ornaments during the Romantic Era, and are still hand-crafted today. The English poet Samuel Taylor Coleridge and the Americans Ralph Waldo Emerson and Henry David Thoreau all found the aeolian harp to possess unique spiritual qualities. The aeolian harp became popular again in twentieth century music with composers such as Henry Cowell, who experimented with innovative techniques in sound production. They have also found a place in contemporary music recordings. Some contemporary aeolian harps are made in the form of monumental metal sound sculptures located on the roof of a building or a hilltop where there is abundant wind to generate sound. Aeolian harps can vary in terms of their basic design. The traditional aeolian harp is essentially a wooden box including a sounding board with 10 or 12 strings stretched lengthwise across two bridges. 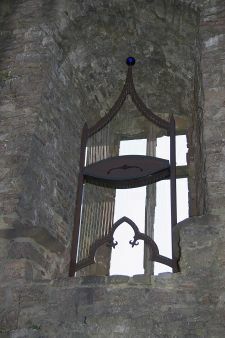 It is often placed in a slightly opened window where the wind can blow across the strings to produce sounds. The strings can be made of different materials or thicknesses. They can all be tuned to the same note or can be tuned to different notes to form chords. There are also larger aeolian harps that stand upright in order to catch the wind with greater intensity. The intensity of the wind crossing the strings determines the variety of tones produced. Although it will not directly affect their pitches, wind intensity does affect harmonic resonances dramatically, creating surprising variations in the instrument's sound. The sound of the aeolian harp depends on construction, tuning, and the strength of the wind passing over the strings. It can range from a barely audible hum to a loud scream. If the strings are tuned to different notes, sometimes only one tone is heard and sometimes chords are formed, producing a haunting effect ranging from calmly spiritual to frighteningly eerie. The wind vibrating the strings produces pitches of the overtone series or harmonics—barely audible higher pitches contained within a musical tone. The presence of these faint pitches is what produces the tonal characteristics of a particular musical instrument. As wind crosses the strings of the aeolian harp, it sets the strings in motion and results in a series of harmonics: most commonly the third, the twelfth, and the upper octave intoning over the fundamental note in the overtone series and acting as a drone. The harp is driven by an aeroelastic effect, known as the von Karman vortex street effect. The motion of the wind across a string causes a periodic vortex downstream and which causes the string to vibrate. The merest motion of the wind across a string forces the air on the leading side to move faster than that on the trailing side. This causes the pressure ahead of the string to be slightly less than that behind, pushing the string further to the side, until the restoring force arising from deflection halts and reverses the motion. Similar to the intentional "feedback" effect in some amplified electric guitars, in aeolian harps, this can multiply the sound to dramatic proportions. The same effect can sometimes be observed in overhead utility lines, which produce a hum sometimes fast enough to be heard or slow enough to be seen. Often mistaken as caused by electricity, the sound is actually caused by the vibration of the wire, similar to that found in stringed musical instruments. A stiff rod will perform in a similar manner. A non-telescoping automobile radio antenna can be a dramatic exhibitor of this effect. The effect can happen in other media as well, such as in the anchor line of a ship in a river. Drawing of an aeolian harp from an article in Scientific American Supplement, No. 483, April 4, 1885. The Etude in A flat major for piano (1836) by Frédéric Chopin (Op. 25, no. 1) is sometimes called the "Aeolian Harp" etude, a nickname given it by Robert Schumann. The piece features a delicate, tender, and flowing melody in the fifth finger of the pianist's right hand, over a background of rapid pedaled arpeggios. One of Sergei Lyapunov's 12 études d'exécution transcendante, Op. 11 No.9, is named by the author "Harpes éoliennes" (aeolian harps). In this virtuoso piece, written between 1897 and 1905, the tremolo accompaniment seems to imitate the sounding of the instrument. Henry Cowell's Aeolian Harp (1923) was one of the first piano pieces ever to feature extended techniques on the piano which included plucking and sweeping the pianist's hands directly across the strings of the piano. In 1972, Chuck Hancock and Harry Bee recorded a giant aeolian harp built by the members of a commune on a hilltop in California. United Artists released their double LP entitled, The Wind Harp—Song From The Hill, part of which was used to created otherworldly sound effects in the movie The Exorcist. In 2003, a large aeolian harp was constructed at Burning Man, an annual event held in the Black Rock Desert, in Northern Nevada. Australian artist, composer and sound sculptor Alan Lamb has also created and recorded several very large scale aeolian harps, including one consisting of long spans of telegraph wire on 12 acres in rural Baldivis south of Perth, Australia. In 2006, Italian Classical/New Age composer, Oreobambo, used the aeolian harp on his CD, Energy Journeys. Aeolus was the Greek god of the winds and ruler of the island of Aeolia. In Homer's Odyssey, Aeolus provides the wandering Odysseus favorable winds to aid him on his journey. English Romantic poet and philosopher, Samuel Taylor Coleridge (1772-1834), immortalized the instrument in his poem of 1795 The Eolian Harp, in which he references the harp and wind as being single aspects of the same universe and origin coming together in a harmonious fashion. Terpsichore, one of the Muses, presided over dance and lyric poetry. In this statue, she is portrayed holding an Aeolian harp. American poet Henry David Thoreau (1817-1862) wrote a poem entitled Rumors from an Aeolian Harp and Ralph Waldo Emerson (1803-1882) also referenced the Aeolian Harp in several of his writings, including The Maiden Song of the Aeolian Harp. According to Cynthia A. Cavanaugh of Kean University, late in his creative life, Emerson (who owned an aeolian harp), viewed the instrument as "more than an instrument; it becomes a symbol of beauty, wisdom, and divine harmony in his poetry." She further asserts: "The taint of human impurity does not touch the Aeolian harp because the music of the harp is produced by nature's breeze. Emerson once told Moncure Conway that, 'A single breath of spring fragrance coming into his open window and blending with strains of his Aeolian harp had revived in him memories and reanimated thoughts that had perished under turmoil of the times." In the Maiden Song of the Aeolian Harp one of the entries in his last book of poetry, Selected Poems, published in 1876, Emerson wrote from the point of view of the personified aeolian harp itself, who declines to be played by a human hand." ↑ Cynthia A. Cavanaugh, The Aeolian Harp: Beauty and Unity in the Poetry and Prose of Ralph Waldo Emerson. Rocky Mountain Review of Language and Literature 56(1) (2002): 25-35. Retrieved August 27, 2018. Bonner, Stephen, The History and Organology of the Aeolian Harp. Cambridge: Bois de Boulogne, 1968. ISBN 978-0900998119. Brown, Chris Cree. The Aeolian Harp Project: The Design of a Musical Sculpture for Christchurch. Christchurch, NZ: C.C. Brown, 2002. ISBN 9780473089436. Hankins, Thomas L., Robert J. Silverman. Instruments and the imagination. Princeton, NJ: Princeton University Press, 1995. ISBN 0691029970. Mansfield, Jonathan. The Design and Construction of an Aeolian Harp. Cambridge: Bois de Boulogne, 1970. ISBN 0900998105. This page was last modified on 25 September 2018, at 20:55.